My daily supps and meds to starve cancer stem cells and thrive. and I’m back on the Berberine for a while. I weigh 54kg so from what I can understand that means 1 a day is just enough to do the job. Someone heavier might take 2 a day. This page summarises the findings on tocopherols being a potent aromatase inhibitor. The mechanisms of anti-cancer activity of tocopherols 1) inhibition of ER (2) increasing peroxisome proliferator activated receptor γ (PPARγ) expression and activity, (3) induction of Nrf2, (4) antioxidative and anti-inflammatory activities, and (5) induction of apoptosis. being Citrus Bergamia extract 500mg. A neo-adjuvant endocrine trial showed a significant association between the increase of SREBP1 expression and lack of clinical response, providing further support for a role of SREBP1 in the acquisition of endocrine resistance in breast cancer. being a cut- in-half tablet of Garcinia Cambogia extract 1000mg. So I’m getting 250mg Hydroxycitric Acid (HYDROXY) ad the rest is fruit of Garcinia Cambogia. ACLY is a cross-link between glucose metabolism and fatty acid synthesis/mevalonate pathways controlled by SREBP-1. Potently inhibited by hydroxycitrate. I swallow my curcumin capsules with Tulsi tea in which I’ve dissolved my Hu Zang for the ursolic acid / resv / curc combo effect. A combination of ursolic acid and resveratrol or ursolic acid and curcumin prevents glutamine uptake by the cancer cell. Brand: I buy organic loose tea leaves in bulk online and drink with each meal. I will mix my other herbs and ginger in it too. being in organic green tea 85ml strong-ish brew. Mclelland, Jane. How to Starve Cancer …without starving yourself: The Discovery of a Metabolic Cocktail That Could Transform the Lives of Millions . Conscious Dreams Publishing. Kindle Edition. A herpes anti-viral drug prescribed by GP after I realized ( reading the book) that the cancer and virus could be closely linked. Brand: Persantin available by prescription- and I was able to obtain due to it’s proven anti-viral action and my bloods showing herpes virus. Dipyridamole is an old anti-platelet medication ( stops blood cells sticking together and so stops them clustering and hiding cancer cells). Dipyridamole starves cancer of the nucleotides and other proteins and enhances the effects of my anti-viral medication. Dipyridamole decreases platelet-derived growth factor levels in human serum. Jane writes in the book that it is a ‘great prebiotic for maintaining a healthy gut, as well as matrix metallo-proteinase inhibitor’. being whole of Japanese Knotweed AKA Chinese herb Hu Zang powder 500mg dissolved in water and drunk. Metabolic Pathway inhibitors: Pentose Phosphate (P P Pathway) and likely more too. being one tablet in water. Mechanism of the irreversible inhibition of human cyclooxygenase-1 by aspirin as predicted by QM/MM calculations. I found this really interesting read in reference to reversing cancer with the help of high dose Aspirin. while I’m taking focusing on lowering cholesterol levels this is good oil. Only take when I’m not avoiding anti-oxidants that recycle glutithione. as DeltaGOLDtm being 90% delta-trocotrienals and 10% gamma tocotrienals from Vitamin E.
Tocotrienols and Cancer: From the State of the Art to Promising Novel Patents. Effects of antihistamine use on survival in breast cancer. being potassium iodine. Brand Bioceuticals. Vit C as calcium ascorbate 12mg, D3 as chlolecalciferol 400IU, Vit-K2 as menaquinone-7 25mcg, Calcium as algas calcareas 180mg, Magnesium from algas calcareas and magnesium oxide 85mg. Support for healthy digestion and return of healthy bones now I’m in state of chemical menopause and want mets to bones to be healing and chose this algae form for it’s higher absorbance into bones. Ginger Powder 5g (all day with everything). I mix at least this amount (usually more) into my breakfast bowls and all teas and make sure it sits beside me at all meals. being 30g in total of my own recipe of sunflower lecithin, water and ascorbic acid – only when I’m not avoiding anti-oxidants. Important: For this 6g to have any chance of effecting the cancer stem cells I have to take it 2 hrs away from many things mentioned here except the Vit E.
being Ashwagandha powder from online herb supplier austral herbs, mixed into my after dinner herbal tea. + I take a pro-biotic every 3rd or 4th day before breakfast & sometimes will take about 6g of melatonin before bed for a few nights in a row and then have a break. I am also in a state of chemically induced menopause from a Zolodex implant. Prescribed by my oncologist and given to me by my GP’s nurse or GP, once a month. This drug inhibits my ovaries from creating hormones. On one hand, I’m celebrating many great test results received throughout 2018. An ultrasound in September showed three tumors across my chest wall have vanished completely and regular blood tests indicate my tumor markers are well and truly in the ‘normal persons’ range. My MRI and full body bone scans from December indicate my cancer is stable and possibly even retreating in one of my vertebrae. I’m also feeling more determined then ever, that I can clear this cancer out of my body. I’m happy with my super healthy, balanced low-carb diet and energetically balanced life, my strong immune system; all have all been a great achievements, but I’m feeling like I’m now in the right place on all levels to totally slay this cancer dragon. I have been fortunate that in the past week I found this new book by U.K cancer out- smarter, Jane McLelland. It’s really a must read for anyone looking to out-smart the dragon that is cancer. Jane has mapped the metabolic pathways of the cancer cells and ways to block these pathways using affordable re-purposed medications, (both over the counter and prescription), alongside close attention to diet and timing specific exercise. I’ll keep you updated to how I chose to engage with the new information I’m integrating from the book and how my body responds over the coming months. I’ve stuck this image of the Goddess Kali to my fridge to inspire me throughout the new year. My (Australian) GP approved my use of Dipyridamole yesterday. The chemist will be able to fulfill prescription next week. I will start with 100mg each day for a week and build up to 200mg each day of a slow release tablet. I have been researching the power of Dipyridamole to inhibit the spread of cancer since I first learnt about it in Jane McLelland’s, How to Starve Cancer book. Along with Glucosamine Sulphate, Mebendazole & Aspirin, this Dipyridamole will seal the deal when it comes to stopping the release of growth factors/enzymes (VEGF’s & MMP’s) that break down the extracellular matrix and could allow my cancer to spread and grow. I will just need to keep an eye on my blood pressure levels and make sure it does not get too low. The out of pocket cost is very low, but I will report back when I pick up the script next week. and the “McLelland Metro Map” which is explained within the book. on their own healing journeys. Nothing written here on this site should be perceived as medical advice. I feel as if I’m now fully embarking on a new leg of my cancer healing journey. I am currently still diagnosed with ‘stable’ stage 4 breast cancer ( which spread to bones in 2017). I believe that living with cancer stem cells in my bones, even in a state of stability or non-progression, is not the future that I want for myself, or anyone else. “The ultimate life hack” is the how one of my friends with breast cancer describes the book by Jane McLelland that explains how to target cancer stem cells with affordable re-purposed medications and herbs. There is a mountain of valuable information in the book that I have had to extract and personalize in order to present it to the people who are supporting me, such as my doctors, my friends and my family. I also imagine that many other people who are currently taking this approach or about to take on this approach might be interested in reading these notes too. If this is your journey as much as it is mine, I encourage you to follow this blog and keep up to date with my progress and any changes I make along the way…and buy the book. Once you have the book please join my private Facebook “How to Starve Cancer The 2018 Book” study group. The group will help you to join in conversations with others who are figuring all this out alongside me. You can invite your friends to the group too via the ‘invite’ window on the group’s page. And use the group as a way of connecting and sharing your own cancer healing journey with myself and others too. p.s..This approach is actually designed for everyone with cancer. We are all in this together…breast, lung, colon..you name it. There will be something helpful for everyone with cancer in Jane’s book. Being diagnosed stage 4 myself, I didn’t get too hung up on my phenotype as it’s well known that cancer is a slippery little eel at this point in it’s life, and I don’t feel comfortable leaving any metabolic pathway open for it to use. Buy the electronic version of the book. Read the book thoroughly. Make, a strictly personal-use only, copy of the McLelland Metro Map. I had the electronic version of the book open on my i-pad and took a screen-shot of the screen. This screen-shot gets automatically saved as an image in my ‘all photos’ photo album on my i-pad. 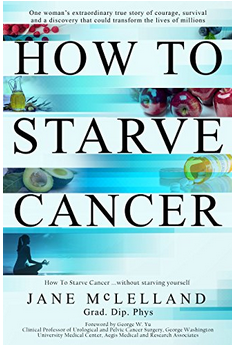 How to Starve-Cancer without Starving Yourself by Jane McLelland. I encourage everyone reading this page to please purchase the book, if you have not done so already. Trust me, if you have cancer, you don’t want to try and simply copy what someone else has done, without reading the book for yourself. I opened the i-pad’s photo application and found the photograph of the map where I had saved it in my private photo album and then used a pen tool in the photo ‘edit’ program to ‘edit’ the screen shot image I took of the map. Editing it involved choosing a pen tool from the tool pallet and running a green colored line under the names of drugs/medications/herbs I was able to access. And yes, of course, I could have also made a copy of the map on to paper and underlined it in pen, but for personal reasons chose to do this step on my screen. I highly recommend anyone interested in killing cancer stem cells buy the electronic version of the book, as it the ongoing researching, is ‘super’ easy compared to using a paperback copy. e.g when reading an electronic version of the book you can right click on any word and choose to “Search Google” for more info, or right click and choose to “search book”…wow..You can then read everything Jane wrote on that drug or topic. It saves a lot of time when you are piecing together the puzzle. You can also quickly highlight large areas and they are automatically saved to your Kindle or e-reader notes. So this simple 2 step process above is where I started engaging with the metabolic pathways and what I could do to block them. 2) underline medications accessible to me in green. The medications accessible to me in Australia without prescription were the first to be underlined. Many people who I have engaged with, in the “How to Starve Cancer…” Facebook groups are taking this same, new and advanced metabolic approach to starving and killing caner stem cells, but with the help of an international oncology clinic. Many of my fellow Facebook “How to Starve Cancer…” private group members from all over the world, are on, and/or at least considering ‘going to go on’ the Care Oncology Clinic (COC) complimentary off-label medicine protocol. The COC is based in the U.K and U.S.A and consult with patients and thier GP’s from all over the world via Skype. As I understand it, the COC doctors will communicate with their patient’s local GP (or at least a GP in the patient’s country, about getting on board and supporting the patient with a simple yet powerful complimentary approach to their current treatment. The COC doctors provide the patient’s GP or oncologist with the understanding and confidence required to prescribe the complimentary off-label, FDA approved medications shown below. I believe that Care Oncology Clinic (COC) are currently (as of Jan, 2019) conducting self-funded research into this 4 drug metabolic approach to killing cancer stem cells ( all types of cancer) and are only prescribing these 4 complimentary medications (listed above) to each and every patient. Out of interest, I created a second personal copy of the McLelland Metro Map onto which I underlined in green just the COC prescribed medications. I compared the two maps. When comparing the two maps, I did observe that the COC protocol was blocking many metro Map pathways with just a few medications. My first map showing the non-COC approach meant buying a larger quantity of meds/herbs and still there were gaps. My personal leaning was towards the more natural herbal supps map I made first. I decided I would try to fill the map with the most natural over the counter medicines first and attempt to incorporate the COC drugs selectively if I ever needed to. I connected with some of the people who were signed up to the COC protocol via my participation in the “How to Starve Cancer…” Facebook groups and soon discovered that many of them were taking a cocktail of cancer stem cell (CSC) metabolic pathway blockers including herbs and supplements ‘on top of’ the four main COC medications. After giving this question some consideration I came to the conclusion that I would attempt to block them all and see how this felt. My stage 2 diagnosis was made 5 years ago and after a mastectomy, and spell of ignorance my stage 4 diagnosis was made mid 2017 (almost 2 years ago). I have no knowledge as to which metabolic pathways, if any, are currently up-regulated and/or which are likely to be up-regulated next. My breast cancer was last reported (Dec , 2018) to be stable, in my bones, (nowhere else) and I’m not willing to, or perhaps even able to, biopsy these bone lesions to obtain further information regarding their preferred energy sources or hormone status. I have no idea what metabolic pathway my cancer stem cells are using and after reading the book learnt that stage 4’s are really better off to be covering all of the pathways at once to reduce the risk of pushing the cancer to a more aggressive state. The ER+ & PR+ ER- hormone receptor status of my breast cancer was reported via breast tissue biopsy when I was first diagnosed stage 2 in 2014. I had a really crap alternative GP back in 2014. It’s almost impossible to believe now, but this really crap local GP advised me, , (me being someone who got a 95% ER+ via biopsy) against taking any hormone therapy. In fact she advised me against seeing an oncologist full stop. OMG, it’s frightening to think she’s still in practice. Anyway, I am very grateful now that I have both a great integrative GP and a great oncologist. I do not believe I have any real way of knowing what the metabolic hormone status of my metastatic breast cancer to the bones is today. What is interesting too, is that the hormone receptor status of a cancer can and does easily change over time. As far as my own personal hormone situation goes, I was still pre-menopausal, at the time of my secondary diagnosis (2017) and immediately awoke from my spell of ignorance placed on me by the 1st GP and went to and oncologist that started me on a monthly Goserlin (Zoladex) implant which stops my ovaries producing hormones, ( Plus I dove straight in with consistent use of high dose Vitamin C, the ketogenic diet for cancer -for at least 6 months, plus loads of ginger powder & curcumin with each meal. Please read www.healingbreastcancer.info for that leg of my journey. O.K, so where am I …as of February 2019? OMG, I’m feeling great …read the post titled “1 day of Supps and Meds” to see what I’m actually taking, how much when and why. I had a week where I was using the Berberine, Niclosamide and Mebendazole but had not started the Hu Znag or Quercetin and that landed me in a whole world of pain. So much so I’m now just on the Quercetin (Glut 1) and Hu Zang (PP)for that side of the map – but have not re-introduced the other 3. There may be a day I do close down the whole Glucose side but right now I’m not in killing mode but more of a metabolic steering mode. This is an inspiring blog post by Cheryse who’s walking this journey a few steps ahead of me with such inspiring grace. Thank-you Cheryse! Have you ever had a season of life that was hard and you wondered what good could possibly come of it? Perhaps at the end of that season, or maybe months or years down the road, you were able to look back and see how that season, despite all of its hardships, resulted in something beautiful? Protection against regular cancer screening procedures. Here’s a link to a great interview for anyone with cancer to hear. It was most valuable for me to listen to, as I am booked in for both an MRI (with ‘no’ contrast fluids) of my spine and a full body bone scan on the same day to monitor my situation. The role of high dose vitamin C to support us in protecting our healthy cells while living with cancer scanning appointments and conventional treatment choices is discussed. It’s now Nov 1st 2018 and my oncologist told me last week that my breast cancer tumor markers have dropped even further. They are now 16. I’m feeling magnificent and I will be getting an MRI of my spine next month to see how my Lumbar region is looking. 5 grams Vitamin C as a 25ml shot of Life Energy C, each afternoon. 1 tspn of organic ginger powder dissolved in water with everything I eat. I’m adding plenty of organic turmeric & ginger powder to breakfast, all cups of tea & to my dinner. I drink organic Chrysanthemum tea with Marshmallow root with some organic ginger and turmeric powder in that too. I am still loving my breakfast bowl of soaked chia, with 1 tspn chlorella powder, whole lemon juice to taste, soaked organic goji berries, 1 tspn organic ginger powder & 1 tspn organic rose-hip powder. Lunches are organic vegetable salads with sauerkraut, sometimes mackerel or chicken & avocado with lightly toasted pumpkin seeds and sunflower seeds. Over the past couple of months I have enjoyed reading the book Radical Remission and the book, Molecules of Emotion. Both have provided me with the opportunity to reflect more deeply on how my emotional state and my sub-conscious state (the body’s intelligence systems of information and energy we call the mind) influence my healing of secondary breast cancer and my ability to maintain my good health going forward. I now know how to muscle test (communicate with my sub-conscious mind about my body’s needs), and for the past 6 weeks I have used The Emotion Code to release trapped emotions from my body. I’ve found the releasing of trapped emotional baggage to be incredibly powerful. Physical conditions which I thought were never going to go away just left – And emotions which I thought were outside of my direct influence, left like a switch was flicked – gone!. I am so impressed with the power of this work that I am now completing The Emotion Code practitioner training so I can support others to release their emotional baggage that is causing stress in their bodies, their life and in their relationships with others. We all deserve to feel this good! I’m aiming to have completed my training by the end of 2018. As a part of my training requirements, I’m looking for volunteers for free sessions with me (November/ December 2018). So, if you are in pain or have a nagging physical condition that you just can’t seem to get over, or blocks to the kind of relationships or life you desire, please get in touch. It is very likely that trapped emotions are getting in the way of your full recovery, your total well-being & your alignment with your highest good. Please contact me if you are interested in booking a free 45min Release Session with me in 2018. These can be done both via video call and in person. I’ll check back in, in late December to share my MRI results with you.